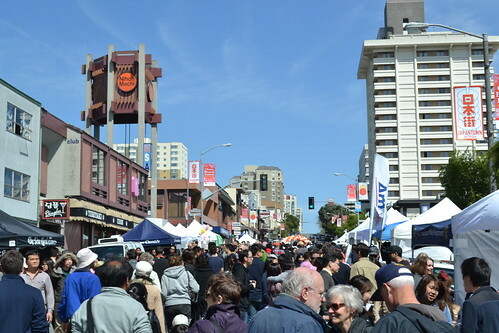 Festival goers flood the streets of Japantown during the 2012 Cherry Blossom Festival. Photo By Juliana Severe. 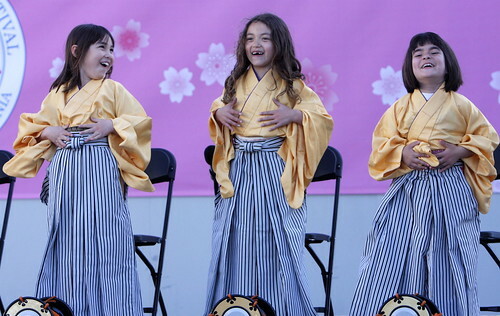 The 45th Annual Northern California Cherry Blossom Festival kicked off Saturday in San Francisco’s Japantown. The four-day event celebrates the arrival of spring and pays homage to the rich Japanese culture and tradition. The festival was originally conceived by Japanese and Japanese American community leaders by using the blooming cherry blossom trees to signify the beginning of spring. Since then it has become one of the largest Japanese American events in the U.S. The Northern California Cherry Blossom Festival hosts thousands of people each year and it’s only the second the largest cherry blossom festival in the U.S. behind the National Cherry Blossom Festival in Washington, D.C. The downpour of rain in the week leading up to the first day of the event didn’t ruin the festivities. It was a blue sky all day for thousands to enjoy. There was a wide array of food at the festival, from spam musubi and sushi to fried Oreos, lumpias and teriburgers. Sapporo was also readily available to wash it all down. The diverse selection gave people of many different age groups and nationalities the chance to bond through this universal language, food. Mayor Ed Lee was present during Saturday’s festivities, along with Hiroshi Inomata, the Consul General of Japan. Together Lee, Inomata unveiled the commemorative stamp for the Cherry Blossom Festival created by the Postal Service to honor the friendship between Japan and the U.S.
SF State Assistant Professor Wesley Ueunten, who teaches in the Asian American Studies Department, is looking forward to participating in the Grand Parade Sun. April 22 with members of Okinawa Kenjin-Kai. Okinawa Kenjin-Kai is a local club dedicated to preserving the Okinawa culture and and exposing the songs and dances that come from it. “It’s fun to participate, it’s been going on for over forty years and that’s something to be proud of that the Japanese American community has continued something like this for so long,” said Ueunten. The group has participated in the parade for eight years, except for last year due to the devastating earthquake and tsunami that rocked Japan. The members of Okinawa Kenjin-Kai will perform live Okinawa music with dancing and drumming. “For a long time the Okinawa culture was something to be ashamed of because its different from Japanese culture so that’s why were trying to show case our culture because were proud of our culture,” Ueunten said. The San Francisco Taiko Dojo, the first taiko group in Northern America founded in 1968, paid respect to the victims of the March 11, 2011 earthquake and tsunami in Japan by performing songs with traditional Japanese drums and choreography. Sixteen cherry blossom trees were also planted in March in Japantown with help from the community and Friends of the Urban Forest to commemorate the anniversary of the disaster in Japan. They hope to plant 30 more trees by this summer. The Cherry Blossoms not only represent the arrival of spring but they also symbolize Japanese tradition on American soil. Coming from white and Japanese decent, 18 year old Maika Frye has cherished this experience for many years. The festival will continue Sun. Apr. 15 and the following weekend Apr. 22-23. Upcoming events include the Northern California Cherry Blossom Court Sun. Apr. 15, Tea Ceremony Sat. April 21 and the Grand Parade Sun. Apr. 22. Clarendon Elementary School students perform in Japantown at the Cherry Blossom Festival on April 14th, 2012. Photo by Cindy Waters.